Our native lupines are a confusing lot, with nearly 600 distinct kinds described in the US. Within a given population bewildering variations occur, and rather free interbreeding compounds the confusion. One iridescent blue butterfly is not confused however. Known to prefer Kincaid's lupine as a larval food plant, the Fender's Blue butterfly, Icaricia icariodes fenderi, was last seen in 1931 and presumed extinct. But careful scrutiny of populations of Kincaid's lupine led to recent rediscovery of the rare insect. Now efforts are underway to protect both the butterfly and its host lupine. This variation of the sulphur lupines is confined to remnant bits of native prairie grasslands in western Oregon and Washington, primarily in the Willamette Valley. Lupines are broadly recognized by radiating leaflets and blossoms that resemble those of other members of the pea family. 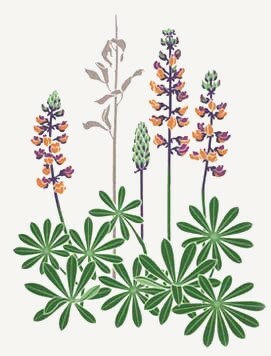 Kincaid's lupine may be distinguished by three characteristics: relatively low-growing basal leaves dominated by upbranched stems bearing uncrowded whorls of smallish flowers, blossoms a varied assortment of colors from yellow to blue to purple, and banner petals with a distinctly ruffled border. The name of Trevor Kincaid, as this lupine, has been ascribed to much of the flora and fauna of the Pacific Northwest. My first encounter was in the subject of my Master's thesis, a tiny aquatic fly that bears his name as original taxonomist (Maruina lanceolata Kincaid). Born in 1872, Kincaid grew up an avid student of nature, making prodigious collections of plant and animal specimens even before entering the fledgling University of Washington in 1894. Within seven years he was head of the Department of Zoology there and continued as inspired teacher, entomologist, and international science adviser until his death at 97, having shaped the early development of zoology at the university.